The Chief Rabbi of Israel, Rabbi David Lau visited the Jewish community of Uzbekistan last week in a historic journey that strengthened the ties between Jews in the two countries. Accompanied by rabbis of the Bukharian communities worldwide and the Israeli ambassador to Uzbekistan, Rabbi Lau met with Uzbekistan’s Minister of Religion and the Chief Mufti, visited communities in Tashkent, Samarkand, and Bukhara, where he met with local residents. After the visit, Rabbi Lau noted that he was very impressed with the local programs and initiatives aimed at reviving and supporting Jewish life in those places. Jewish life in Uzbekistan dates back to over 500 years ago when a historic synagogue in Bukhara was erected. It was also am important safe-heaven for Jews during WWII, when the former Soviet republic became home to thousands of refugees from across the country. After the fall of the Iron Curtain, most of the country’s Jewish population immigrated, however, those who stayed today enjoy the revival of Jewish community life, which includes a recent opening of new mikvah ritual bath in Tashkent, sponsored by the Leviev family. At the government meeting during his visit Rabbi Lau thanked the officials for the equality and freedom Jews have enjoyed in Uzbekistan throughout the years. He also asked the government’s assistance in cleaning up and renovating a Holocaust survivors’ cemetery, which needs additional upkeep and was promised immediate support. 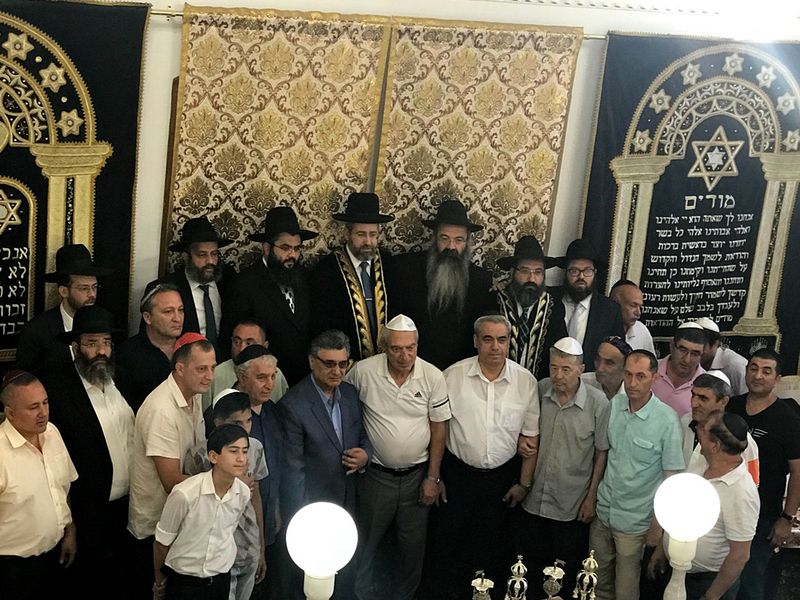 “Our community members were very excited to meet the Chief Rabbi of Israel, his visit revitalized our activities and provided energy for the future,” said the Chief Rabbi of Uzbekistan Rabbi Baruch Abramtzev, who accompanied the delegation throughout the trip.